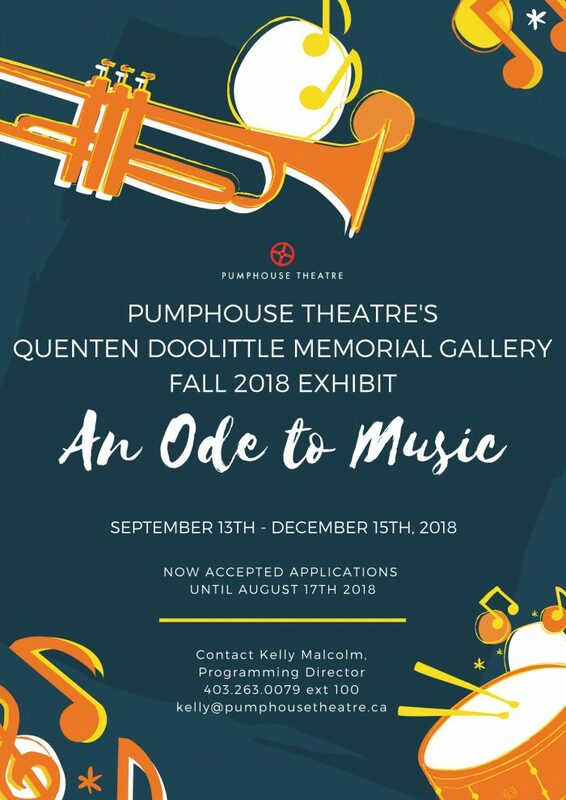 This past March, we at the Pumphouse Theatre were deeply saddened by the loss of musician, teacher, and friend Quenten Doolittle. Quenten was the beloved husband of sixty-seven years to our theatre founder, Joyce Doolittle, and passed away on March 9, 2018, at the age of 92 years. Quenten was born in Elmira, New York on May 21, 1925, and was the fifth of seven children. He served in Europe in the U.S. Army in the Second World War. He studied music at Ithaca College, earned a master’s degree from Indiana University, and earned his Doctorate in Music with a major in violin from the Eastman School of Music in Rochester, New York. In 1960, Quenten became the second appointment in the new University of Alberta at Calgary’s Department of Music. Quenten played with the Calgary Philharmonic for many years and was principal violist for seven of those years. While still at the University of Calgary, Quenten, along with the artist John Snow, founded New Works Calgary, an organization with the mandate to perform contemporary classical music, especially the work of local and western Canadian composers. Quenten composed over fifty works, including orchestral, chamber, vocal and solo works, and four chamber operas including Boiler Room Suite, performed in Banff, Toronto, Cardiff, Wales and London, England, and Charlie the Chicken performed in Toronto, Calgary, and Montreal. He composed and chose the music for the scores of plays Joyce directed for the university department of drama, and many other theatrical collaborations ranging from musical theatre to music and sound scores for plays and film. Even into his 90s, Quenten loved athletic pursuits and artistic ones. He was a strong swimmer and throughout the winter skied weekly in the mountains. He also developed a passion for art; most recently showcasing an exhibition at the Pumphouse Theatre in partnership with United Living. We were so blessed to have had Quenten as part of our lives. His contribution to Canadian arts and culture was incredible and will be forever remembered. In honour of him and his legacy, we are happy to announce the renaming of our Lobby Art Gallery to be the Quenten Doolittle Memorial Art Gallery beginning with our first exhibit of 2018 to be a reflection of his great passion – music. We hope that this will be a fitting tribute to a man who inspired us, and will continue to inspire the artist to come. 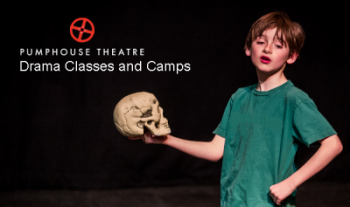 The Pumphouse Theatre has presented the Calgary Region One-Act Play Festival with the Alberta Drama Festival Association for over 30 years and we are excited to do so again! The Festival will be held March 22nd – 24th, 2018 in the Victor Mitchell Theatre. Each night will be a collection of 2-3 one-act plays, varying in genre and style. 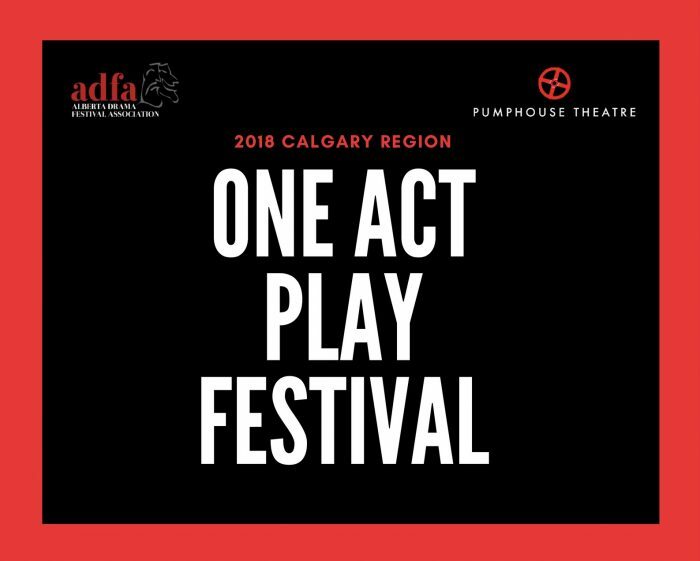 One play will be chosen by a professional adjudicator to represent Calgary at the Provincial One-Act Festival, which this year will be held in Fort McMurray. Each of those chosen plays receives travelling expenses or a grant to assist in funding their participation in the Provincial Festival by the Alberta Drama Festival Association. This year our adjudicator is Shari Wattling! GROUP BIO:Theatre SHHH! was created to produce Sienna Holdens final project, “Songs for a New World” during her final year of acting school at Rosebud School of the Arts. A.W.A Productions have come together to perform for this festival. Featuring the acting talents of Lisette Allan and Kurt Archer, directed by Randolph West, and lit by Trevor Somers. All participants have been involved with the Calgary theatre community for several years. Reckless Daughter Creative is a Calgary based collaborative group, originally created by Madeleine Taylor-Gregg and Ashley Humphries, to represent the emerging female artists and their stories. The Gang of Three is an ad hoc performance troupe based in Calgary. Two of the actors are teachers, the third actor is from Belarus, and the director is insane. Dropbear (Michael) & Panda (Jennifer) tend to “do what they want” because they believe life should be full of art and adventure. Over the past two years, Dropbear & Panda have been producing and creating short films, music videos, corporate videos and CDs. Buoyed by occasionally misplaced confidence and an insatiable urge to create, they thought, “how hard could writing, directing, and performing our own original play be?” Jennifer is a serious actor in community theatre around Calgary and Michael is a regular on stage at Loose Moose Theatre doing decidedly un-serious improv. Together they form Dropbear & Panda. 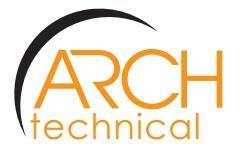 Sponsored by Arch Technical Inc.
We are pleased to announce the competition for the summer camp positions! The deadline is May 4th. 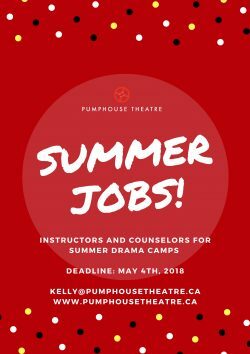 Due to the structure of the Canada Summer Jobs funding program received by the Pumphouse Theatre, applicants currently enrolled as post-secondary students and continuing their education in the fall of 2018 will have an advantage. 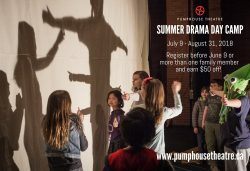 If you have any questions, please contact Kelly Malcolm, Programming Director at kelly@pumphousetheatre.ca or by phone at 403-263-0079 x 100.